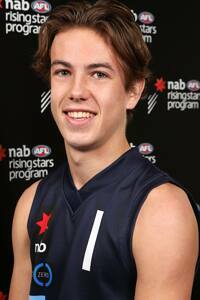 Draft highlights: Callum Brown Watch the best of Collingwood draftee Callum Brown. Brown was recruited at pick No. 35 in the 2016 National Draft. Callum Brown was an All-Australian at under 18 level in 2016. Brown is the son of Collingwood 1990 premiership star and former captain Gavin. His improvement has been steady but significant across 2016. Brown played for the Eastern Ranges last year and did some exciting things, including a three-goal haul in the Preliminary Final of the TAC Cup. He's taken his talents into the midfield this season, and become a regular ball-winner. Brown isn't overly quick but moves well and rarely gets caught. He averaged 18 disposals in four games for Vic Metro at the national championships and was named an All Australian. It's not a bad time to be a short midfielder, and Brown is a little like Lachie Neale in the way he plays and his strengths. "He’s as clean below his knees as I’ve seen – he’s very much Caleb Daniel like as well in terms of how he doesn’t waste his possessions. He’s probably a 15 to 30 metre player in terms of his kicking at this stage, but as he continues to develop that power in his legs, which he’s got – his vertical is very good, his speed is getting better, he is just going to keep growing into his body – and the one thing he is, he is just super competitive, super determined, very driven and just a beautiful, natural footballer," – Len Villani (Eastern Rangers talent manager), Inside Football, November 2016. "Such has been his TAC Cup form this year, Eastern Rangers talent manager Len Villani said the 18-year-old had roared in his estimations from being a potential rookie or late draft pick 12 months ago to a late first-round or early second-round pick. Villani said the best of Brown, who has based his game on Port Adelaide’s Robbie Gray and Fremantle’s Lachie Neale, was yet to come." – Toby Prime, Manningham Leader, 22 August 2016. "Callum and Josh Daicos spent a week with us during the pre-season and it great to have them down. They are fantastic young men. They really thrived in the environment here. Just having them around was first class and both them threw themselves into it flat out. Nothing was too hard. Even when they fell short, they dusted themselves off," – Nathan Buckley, 5 April 2016. "Callum was running around at Marcellin last year but was really small and then he did some special things and has grown up sideways and a little vertically. He has always been great with his hands and with his vision and composure and now he can win his own footy and doesn’t get brushed aside," – Anton Grabic (Vic Metro coach), Herald Sun, 15 June 2016. “He’s a brilliant midfielder. He continues to improve, whether it’s his fitness or his size and he wins a lot of the ball. He’s always in and under the packs and he competes all day for four quarters,” – Josh Daicos (contemporary and son of Peter Daicos), Herald Sun, 7 October 2016.